Back cover blurb: When an 18-year-old girl returns home to find her house covered in blood and her mother missing, Detective Maeve Kerrigan and the murder squad must navigate a web of lies to discover the truth..When eighteen-year-old Chloe Emery returns to her West London home she finds Kate, her mother, missing and the house covered in blood. There may not be a body, but everything else points to murder. Maeve Kerrigan is young, ambitious and determined to prove she’s up to her new role as detective sergeant. In the absence of a body, she and maverick detective Josh Derwent turn their attention to the neighbours. The ultra-religious Norrises are acting suspiciously; their teenage daughter definitely has something to hide. Then there’s William Turner, once accused of stabbing a schoolmate and the neighbourhood’s favourite criminal. Is he merely a scapegoat or is there more behind the charismatic façade? As the accusations fly, Maeve must piece together a patchwork of conflicting testimonies, none of which quite add up. Who is lying, who is not? The answer could lead them to the truth about Kate Emery, and save the life of someone else. Let the Dead speak is Detective Maeve Kerrigan novel Number 7, and the first one of Jane Casey's novels that I've had the pleasure of reading. It is a novel that has a dark and foreboding atmosphere right from it's outset. When Eighteen Year Old Chloe Emery returns home early from a weekend away with her Father to find her family home saturated in blood, her Mother nowhere to be found. It is a living nightmare. Chloe has led a sheltered live since her parents split years previously. Her Mother Kate is ridiculously overprotective and wants Chloe to rely solely upon her. Growing up Chloe has been assessed by many different psychologists, her Mother keen to pin a diagnosis on her, the psychologists coming to the conclusion that Chloe has a mental age of someone much younger. When DS Maeve Kerrigan arrives at the scene, Chloe is immediately removed from the house, deep in shock, she is sent across the road to stay with her religious neighbours the Norris's. With her colleague Josh Derwent to assist, Maeve begins a thorough search of the bloodied house. It is clearly the scene of a horrific murder. But where on earth is Kate's body? And more importantly who has killed her? With no body and seemingly no motive for Kate's murder, everyone on the street where she lived is a suspect as well as her ex-husband, his new wife and their children. DS Kerrigan and her team must work quickly to find her killer before anyone else is put in danger. 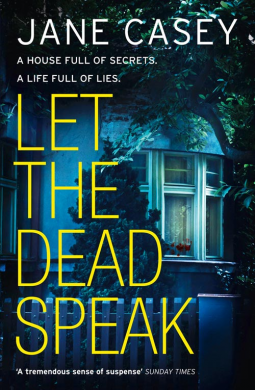 Let the Dead Speak is a gripping novel with plenty of surprises for even the most prolific crime thriller reader. Let The Dead Speak is available now via Amazon online and all good book shops.